An improved brain organoid cultured at the air-liquid interface showing aligned nerve bundles, colour-coded by their orientation. Cerebral organoids, also sometimes called mini-brains or brain organoids, have become an important and useful tool in understanding human brain development and disease. They have the potential to model brain functions, such as information transfer between neurons, but restrictions in their growth have so far limited this. Now, Madeline Lancaster’s group in the LMB’s Cell Biology Division, have for the first time demonstrated that cerebral organoids can direct muscle movement. In collaboration with Marco Tripodi’s group and Emmanuel Derivery’s group, both also in the LMB, and researchers at the University of Cambridge, they have made significant advances in this field. Cerebral organoids are three-dimensional tissues generated by directed differentiation of human stem cells, with the resulting neural precursor tissue spontaneously self-organising into structures and layers that resemble the early human embryonic brain. Their growth, though, is restricted, both in terms of how large they can grow and how long they can be maintained in a dish, as they do not form blood vessels through which nutrients and oxygen are supplied. This has prevented the study of later neuronal development. Ordinarily, cells are maintained submerged in a nutrient-rich liquid media, which provides little access to oxygen and therefore limits growth. Stefano Giandomenico, a researcher in Madeline’s group, helped develop a method for growing a slice of cerebral organoids on a porous supporting membrane such that the tissue is at the air-liquid interface. This gives access to the nutrient-rich liquid media below and oxygen in the air above. 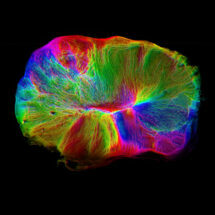 This allowed the mini-brain model to be maintained in the dish for longer, so that it could mature further. Stefano observed neuronal maturation in the cerebral organoid slice using long-term live microscopy and electrode arrays to measure neural activity, allowing the researchers to see patterns of connectivity between different regions of the mini-brain. Most notably, they placed a piece of mouse spinal cord and adjacent back muscle near to the organoid to see if neurons from the mini-brain slice would grow out to connect with it. Not only did some specific neurons from the organoid grow out to and connect with the spinal cord, but, most remarkably, the mini-brain projecting neurons could stimulate muscle contractions just as motor neurons do in our own bodies. This is the first demonstration of a functional output from cerebral organoid tissues in a dish. The capacity for this model to be used to investigate the way in which neurons connect up within the brain and with the spinal cord could have important implications for our understanding of a range of diseases. In particular defects in neuronal connectivity are thought to underlie various psychiatric illnesses, including schizophrenia, autism, and depression. Similarly, this model could shed light on conditions in which connectivity is disrupted, such as stroke or dementia. Although this new approach allows better maturation of mini-brains, they are still very small and lack the full repertoire and organisation of brain regions that are required for higher cognition. Nevertheless, they have the potential to significantly increase our knowledge and understanding of neuronal development. The work was funded by the MRC, BBSRC, ERC, Welcome Trust, Newton Trust, and HFSP.